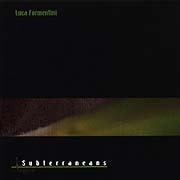 On his album Subterraneans (72'49"), Luca Formentini seems to be investigating sound for the sheer satisfaction of discovery. Described by the author as "a life from the inside", Subterraneans is Formentini's personal exploration into tone and how it relates to mood, and the many new possibilities that surface when one plays a conventional instrument in an unconventional manner. On this album Formentini, known as a guitarist, takes his instrument beyond what it was designed to do. Through innovative performance techniques as well as electronic effects processing, his music can approach the uneasiness of the avant-garde, and just as easily float back to the safety of ambient music's harmonious static state. There are 16 tracks on this album. Each one, however brief, is original and complete. Formentini's skill with timing, harmonic composition and a sophisticated ambient strategy provides unique yet listenable results. As with peering into an individual, this album may be difficult to access. Sometimes strange, always imaginative, Formentini's music is unexpected; the wonderful result of traditional training yielding to wanton experimentation.